Radio Cavell is an unique service to the Patients, Staff and Visitors to the Royal Oldham Hospital, providing a mix of Information and Entertainment taking into account the needs of the wide range of people who stay, visit or work in the Royal Oldham Hospital. A service that helps make a stay in hospital just a little bit more bearable by making the patient feel a little less alone. As well as providing a service to those the patients and visitors in waiting rooms, clinics and the many staff who work in the Royal Oldham Hospital. Radio Cavell plays a role in promoting and positively enhancing the health services and facilities being offered to the people of Oldham, and assisting in the improvement of the Health of the Nation. Oldham has an very long tradition of hospital broadcasting. In the mid 1930's the Matron at the Boundary Park Hospital organised regular Friday afternoon "patient entertainment broadcasts" over the 'Tanoy' system. Radio Cavell was formed in 1972, and since then has continued to develop into the service we hear today. 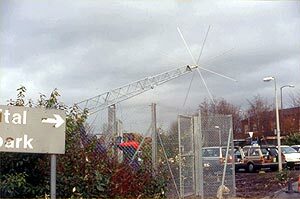 Radio Cavell's permanent mast being raised from the horizontal to the vertical position in the early days. Radio Cavell's provides a service of a sort not available elsewhere. The evening's concentrate on the audience in Hospital Beds, with a large amount of Patient Participation. Our team of volunteers meet the listener in person before the broadcast, and become more than just a voice on the radio. This is supplemented by a variety of specialist music programmes in the early evening ranging from Big Bands, through 50's Rock and Roll, to Organ and Keyboard Music. Radio Cavell is also committed to providing a quality sports service with Oldham Athletic and Oldham Rugby League commentaries. During the day the attention moves to the wider audience around the hospital in clinics, outpatients departments and staff on breaks with a blend of music, health and hospital related information. We also bring the 'outside world' into the hospital so that patients do not 'miss-out' on events. Our outside broadcast team can regularly be found at events such as Concerts at The Queen Elizabeth Hall, varied local events, The Hospital Gala, Election results, the Hospital Chapel and Christmas Carol Services, Ward Open Day's, Services of Remembrance, and very many others. 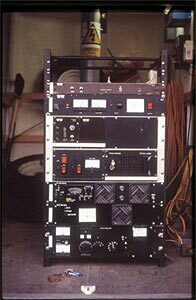 Radio Cavell has always been at the cutting edge of hospital broadcasting, embracing new technologies and opportunities. We were one of the first stations to operate under a new Radio Authority licence for a "freely radiating signal" that can be received on a normal radio set. This has opened up tremendous possibilities for Radio Cavell. Along with recent innovations in broadcasting technology have enabled Radio Cavell to become a 24 hour a day Information and Entertainment service for The Royal Oldham Hospital. Although it is possible that the radio signal on 1350 AM may be heard beyond the hospital site, it is a condition of the licence that we do not acknowledge this and that we do not seek to involve these 'listeners' in the broadcasts. Comment by Mika Mäkeläinen: The station can indeed be heard beyond hospital grounds, and has been logged several times at least in the Scandinavian countries. I heard the station in Finland in summer 2002. 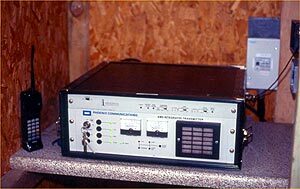 1350 kHz is one of the few frequencies in Europe which are free of high-power stations, making it possible for low-power UK stations to be heard quite far. 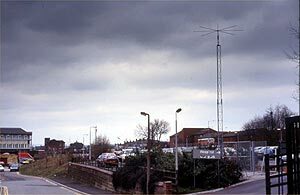 However, the most "common" station from the UK here is Kingstown Radio, and Radio Cavell can be considered a very good catch anywhere outside its small target area.